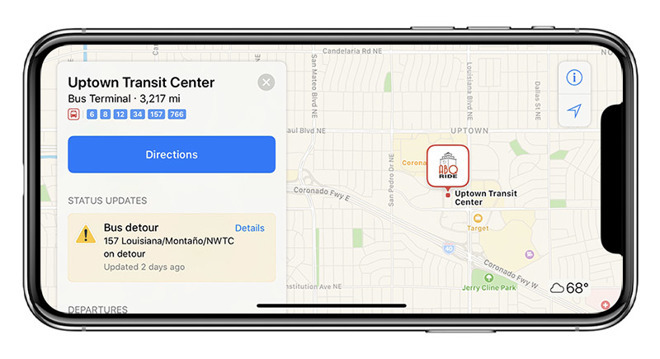 Apple on Wednesday continued its rollout of public transit data with an activation of services in Albuquerque, N.M., allowing Apple Maps users in the area to plan bus trips, find routing information and more. Though not yet added to Apple's iOS Feature Availability website, AppleInsider has confirmed Transit data is now live in Albuquerque. Residents and visitors to New Mexico's most populous city now have access to information provided by ABQ RIDE, a local transit agency providing bus and bus rapid transit services across 40 routes. As with previous Transit rollouts, Maps furnishes arrival and departure times, route creation tools and local service advisories. In addition to Albuquerque bus data, Maps now features integration with the New Mexico Rail Runner Express rail service operated by the Rio Metro Regional Transit District. The commuter train runs from Belen to Santa Fe, with stops in Albuquerque, Bernalillo County, Los Lunas and other towns. Apple's in-house Transit feature debuted with the release of iOS 9 in 2015 as a replacement for Google Maps' public transportation technology. Transit provides the usual assortment of navigation aids including routes, departure times and other relevant data for buses, trains, ferries and other forms of public transportation. Unique to Apple's solution are top-down views of select underground subway and train stations, which feature labels for entrances and exits. Apple launched Transit in the U.S. and China in 2016, later rolling out support in the UK and Japan that same year. The product arrived in Paris, Singapore, the Netherlands and Adelaide, Australia in 2017. Apple over the past few weeks accelerated U.S. integration, activating Transit in Orlando, Fla., and Arkansas last week, followed by West Virginia on Monday.